When installing windows, nail the flange with galvanized roofing nails, but don't put any nails in the top flange. A wheelchair ramp should not be steeper than a rise of 1' for every 12' in length, except for very short wheelchair ramps. This means that if the vertical rise in the wheelchair ramp is 1' high the horizontal distance should be at least 12' long. Let's continue with my early construction experiences in the summer months of my high school holidays. In the summer months of 1961, during the holidays from school, I worked with my father on the site of a new hotel in Richmond, BC, not far from Vancouver International Airport (YVR). I learned about transit and level this summer. It was only Dad and me working on the site while 1000's of cubic yards of sand were being trucked in. 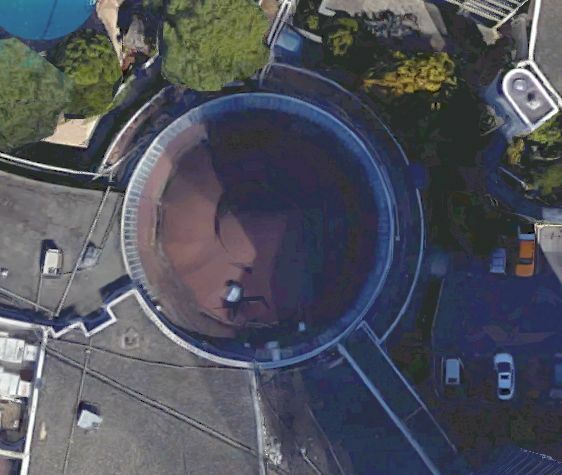 Between trucks, Dad was laying out the circular area of the bar, the beer parlor, he called it, shown in the center of this Google Earth photo. He used the transit for getting the correct position of the foundation for the bar and used the level for the correct elevation. I was his helper, holding the rod for elevations and the chain for the positions. The engineered plans showed the position and elevation of a point on the property called the bench mark. Dad was very good for explaining to me what he was doing. That was the only training I had in survey work. I became proficient in the builder's level, but never had to lay anything out with a transit. On the big jobs the company would hire engineering students to do this layout for the carpenters. In residential work we would lay out the foundation mainly from property line setbacks, which was straight forward. Elevation, on the other hand was very important to get our foundation walls 8" above finished grade and level. That summer, I really bonded with my father. During the last few years answering questions on this website, I've retained a few good examples of different types of deck stairs. Here is an example of the basic deck stairs off a raised backyard wood deck. Notice that the one piece 4x4 posts holding the deck stairs railing also carry the weight of the stair stringers. When attaching stair stringers to a backyard wood deck with only a 2x6 box joist, there usually is nothing to attach the stair stringers to. Here the stair stringer is bolted to the posts and a ledger board is installed under the stair stringer for those with a longer run. Either pressure treated wood or concrete pads are shown under the posts and bottom stair of the stair stringer, rather than having the stair stringers and posts just sitting on the ground. In this drawing, tapered deck stairs are shown with the stair treads having equal depths as they turn the corner. This example shows a run of deck stairs between two levels of a backyard wood deck. Notice in this drawing that the deck stair treads are extended in depth so that the stair nosings are all the same lengths. In this drawing is a raised backyard wood deck of about 5' with deck stairs returning back to the deck. A set of deck stairs such as this is a bit more complicated than the simple deck stairs in the first drawing. This example is from a custom plan that I drew up for Tom, a member of our site. Refer to my article Deck Stairs with Returns. for the plans for these deck stairs. Other ideas for deck stairs may be to climb up to a pool or hot tub. Rather than climbing up to a pool, here is a sketch of a pool or hot tub enclosed by a deck, but not sitting on it. The pool or tub is sitting on a level bed of compacted sand. Here is a drawing I did for a couple who had to contend with the back garden sloping 90 degrees to the direction of the deck stairs. Notice how we divide up the vertical height difference as well as the width of the deck stairs for the supports, so that each support has a different height. Since the height difference is 4" we can still stay in the safe envelope of riser height by starting with a height on the left of about 4" and ending with a height on the right of 8". I hope some of these drawings will help you in deciding how to build your deck stairs and your backyard wood decks.